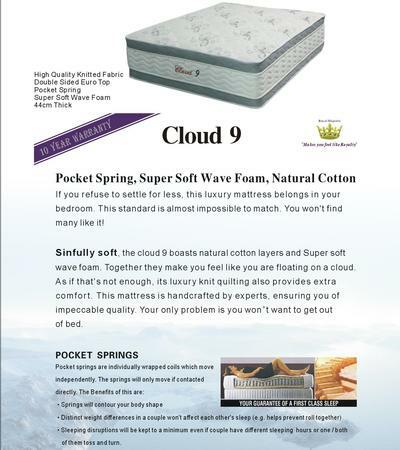 Cloud 9 Mattress -This Mattress is a high quality knitted fabric mattress with Double Sided Euro Top, Pocket Spring with Super Soft Wave Foam. The mattress is 44cm thick in depth. This mattress also has a 10 year warranty. This mattress is available in Single, King-single, Double, Queen and King size mattress. If you refuse to settle for less, this luxury mattress belongs in your bedroom. This standard is almost impossible to match. You won't find many like it! Sinfully soft, the cloud 9 boasts natural cotton layers and Super soft wave foam. Together they make you feel like you are floating on a cloud. As if that's not enough, its luxury knit quilting also provides extra comfort. This mattress is handcrafted by experts, ensuring you of impeccable quality. Your only problem is you won't want to get out of bed. - Distinct weight differences will be kept to a minimum even if couple have different sleeping hours or one / both of them toss and turn.